A Generic Uranium Ore sample in the 5,500 to 7,000 CPM radiation range. Ideal for beginning mineral collectors or as an inexpensive radiation source. Our generic sample is typically plain and unremarkable with few or no unique features - unlike our individually priced samples. Generic samples are useful as inexpensive radiation sources and for chemical extraction/analysis. 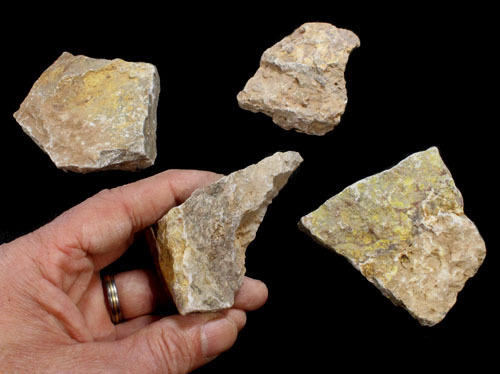 The ore sample typically measures anywhere from about 2" across to 3.5" across. A generic sample can contain one or more of the following Uranium minerals: Carnotite (bright yellow), Uraninite (black crystal), Pitchblende (jet black), Uranophane (canary yellow), Gummite (maroon to rust brown), and Tyuyamunite (green to yellow).